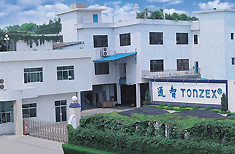 Tonzex Group is a professional manufacturer of gift and stationery products since 1985, with a mission to provide a variety of innovative, dependable and premium products that will excel well above industry standards and appeal to the global market. Specialize in world time alarm clocks, digit clocks, games, calculator, electronic massages, speakers, LED products, computer accessories ... etc. The machinery including: I.C. bonding machine and plastic injection molding machine etc. To produce all kinds of mold and advanced machinery. The machinery including: CNC computer molding machine and spark machine. To produce P.P. file holders, handy document bags, and related P.P. series product, which are all recyclable. Our machinery including: P.P. thin sheet and thick sheet making machine, four-column hydraulic presses machine, hot stamping machine, and P.P. CD insert machine. To produce organizer, bag, portfolio, rolling backpack, wallet, and C.D. holders. The machinery including: Automatic stitching facility and stitching conveying line. For welding of polypropylene and PVC products. machine. To produce gift boxes, organizer refills, instruction manuals, booklet, and all kinds of BTS Printing products etc. Our machinery including: Color-spray facility combined with waterfall precautionary system, 4-color printing machine, dual side printing machine, 2-color printing machine, single-color printing machine, paper ruling machine, limination machine, automatic die cut machine, automatic pagination machine, and automatic folding machine etc. We are in confident to fulfill you need with flexible machinery. "Innovation", "diligence" and "service" are Tonzex's core values. These will enable us to stay ahead of the times, and to create new opportunities. Our objective is to build long lasting relationships with our business partners by manufacturing the best products and providing competitive prices in the expanding markets. Visiting our China factory is sincerely welcome. Please contact with our sales department if you have any questions or further information requirements.